2018 UPGRADED Sweatproof hands-free calls bluetooth wireless earbuds for any bluetooth enabled devices. √ Long-lasted Battery: 100 hours stand-by and 2 hours talking/music time. ✅【COMFORTABLE DESIGN & SWEATPROOF】: Super lightweight and the stabilizer design according to ear geometry to ensure secure, comfortable fit for any ear. Anti-sweating material keeps the in-ear bluetooth earphones fully function even when dripping with sweat, offers sweat-resistant protection while running, biking, training, jogging, hiking, exercising. ✅【UNIQUE QUICK CHARGE BOX】: Ultra-lightweight and portable charging case with large capacity lithium batteries, which can support 8 times fully charging for the wireless earbuds and let you enjoy 2 hours continuous music or talking time after every single charge. The charging box only take 1 hours and the wireless earbuds only take 2 hours to fully charge. Easy to carry, no worry about the wireless earbuds power off. 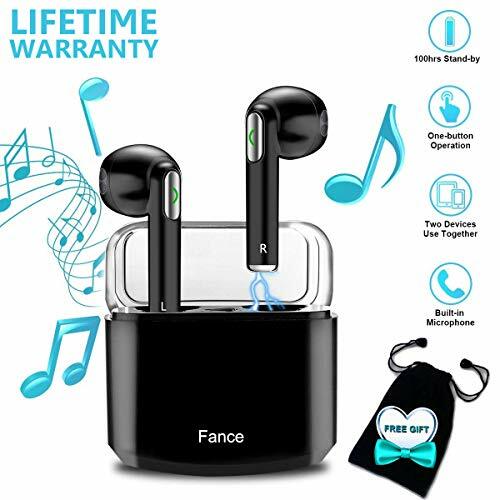 ✅【FAST AND STABLE CONNECTION & WIDE RANGE 】: Advanced bluetooth V4.2+DER (Enhanced Data Rate) system let you enjoy high-fidelity sound with the bluetooth earbuds, faster pairing speed and stable connectivity. The bluetooth connection range up to 33 feet (10m), if your smartphone put in the bedroom, you can still enjoy music or never miss any calls when you are in the kitchen. ✅【CONVENIENT USE & LIFETIME WARRANTY】: The bluetooth earphones is covenience to use separately or both using to share with friends so no one misses out on true wireless Hi-fi sound and enjoy together, the one button design allows to switch to music or phone call freely. We promise you every quality wireless earbuds and friendly customer service, LIFETIME WORRY-FREE PRODUCT GUARANTEE for ensuring the long-lasting enjoyment of your wireless bluetooth earbuds.